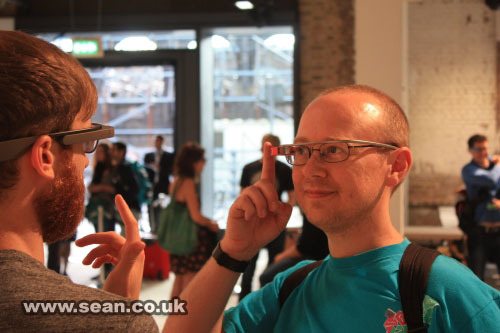 Google has put its wearable technology Google Glass on sale in the UK for the first time, and opened a hands-on showroom in London for two days, where visitors had a chance to try the devices for themselves. I went along and put the glasses to the test. 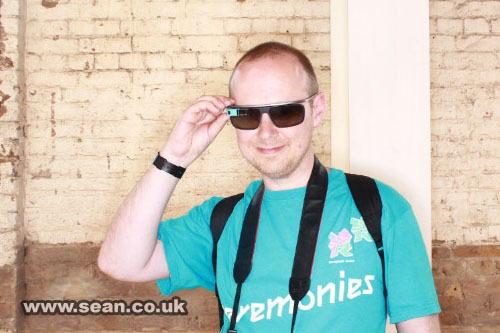 Me trying Google Glass shades, in a colour that matches my top. Google Glass is a wearable computer. It mounts a tiny screen just above your right eye, which feels similar to viewing a television 8 feet away, a demonstrator said. The screen can show text, maps and images. It includes many of the computing capabilities of a smart phone, including a built-in camera, voice recognition, and GPS for positioning. It is said to have a battery life of a day under normal (intermittent) usage conditions. It uses Wi-Fi for connectivity and can be tethered to an Android phone or tablet, which would also be used to manage the installation of apps on it. A Wi-Fi connection can be set up by showing the device a QR code, which your phone can generate. 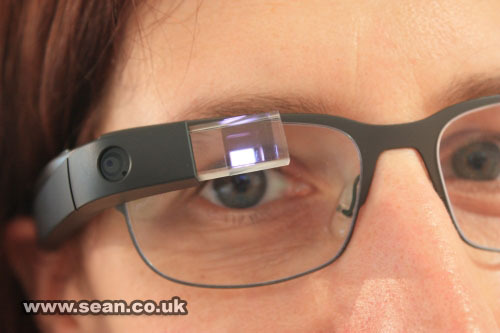 A Google Glass device, with the camera lens and the transparent screen on the left. There are also some non-contact gesture controls. You tilt your head up and down to scroll through menu items, and to look around an image in some of the apps. There's an experimental feature to take a photo by winking at Google Glass, which I tried out. This could be useful for doing quick grab shots of things as a reminder for later, but I'm not sure it would be useful for proper photography. Google search: I tried a simple voice search and this worked well. It delivered text from Wikipedia for my search term, together with an image. I don't think the device is really designed for web browsing, but sites that are designed with accessibility in mind are more likely to be able to provide information in a useful form. This feature will be valuable for settling pub debates, and I can also see it would be helpful when I'm out and about doing research for writing projects, by enabling me to look up more information on what I'm looking at. Translate this: Having recently returned from a trip to China, I could certainly see the value of this app. Wordlens is an app that translates written text in front of you. There were some example signs around in various supported languages and the app replaced the text in them with machine-translated English text. This is a very cool feature, although it takes a while to get used to. You tilt your head to look around the image, so I had to look up at the ceiling to see the top of a sign that was right in front of me, which felt unusual, but would probably become intuitive with practice. Maps: You can call up a map using voice recognition, although my attempt to get a map for 'Baker Street' wasn't recognised until I added London to it. The voice recognition doesn't require Wi-Fi, I was told, which is a different model to Apple's Siri system. Siri uses cloud computing to access a short burst of computing power from Apple's servers. Google is relying on the intelligence in its device. The maps were rendered well and I could see how they could be a useful aid when walking somewhere new. Obviously, they're inappropriate for driving, and there are warnings built in to remind you of that before you're shown a map. Explore the stars: This app showed you the stars in the night sky, and changed the selection as you moved your head to focus on a different star. I couldn't compare this to the real night sky, but looking around the sky image felt natural. When you focused on a particular star or body, a description was played to you using bone conduction. This is a form of audio that can't be heard by others. I struggled to hear it myself, even when following the advice of blocking my ear, and the audio sounded broken up. However, it was an unsympathetic environment for testing things like this, because there was loud music playing nearby. Recognise this: This voice command activates Shazam for recognising a song that's playing. This worked for one of the two songs I tried, and provided internet-quality lyrics in synch with the music, which was a nice addition. I don't think this is a killer feature for the device, but it's a nice addition and would I'm sure be something that I used if I had it. There are other apps available. I spoke to one Googler who'd been using it extensively, and he said the thing he finds most useful are Google Now cards, which provide timely notifications. For example, it'll tell him if he needs to leave early because there are delays on the train, or proactively give him information about today's flight. The Facebook app is for posting only, and not for consuming information, which seems sensible. Nobody needs to have Facebook on their face all day. The Twitter app enables you to select people whose tweets you'd like to see in your Google Glass. One person I spoke to said that Google Glass is about helping you to live in the moment, and I would imagine that it will be important for apps to be designed in line with that principle, otherwise they will become a permanent distraction. Naturally, there's some concern in the media about the privacy implications of Google Glass. The Register has described the device as 'creepy', and some people are unsettled by the idea of someone having a lens on their face. It's quite hard to take a photo discreetly, though, because you have to touch the frame, use a voice command or wink. The video is set to a maximum of 10 seconds by default, and then needs to be extended by interacting with the device. The screen lights up when Glass is active too. Nevertheless, as wearable technology is adopted, new norms for usage need to evolve. One person I spoke to said that he'd got into the habit of putting Google Glass on the back of his neck when he goes into the bathroom, to make sure there are no misunderstandings. Google Glass sits above the eye, so it doesn't block eye contact. You'll have a pretty good idea of when someone's using Glass and when they're paying attention to you. Google Glass is now available to order in the UK. Although it's not targeted exclusively at developers, it is still an early adopter product at the moment. The software has had 14 releases in 4 weeks, and there's still a lot of testing and iteration going on. It will be interesting to see how wearable technologies ultimately change the way we interact with information. The killer feature of broadband turned out not to be its speed, but its always-on connectivity, which meant we could ask any question at any time. Similarly, having the internet always available at a voice command, without even having to fumble with a phone, will change how we receive and consume information. The demos shown at the event were fun, but I think the most useful apps will turn out to be those that have the greatest impact on our daily lives: simple notifications, productivity and travel apps. 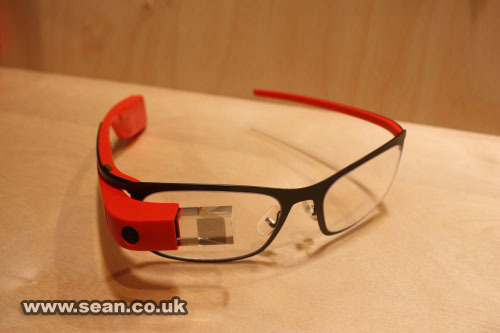 Now Glass is in the UK, app developers here have a chance to shape those apps. 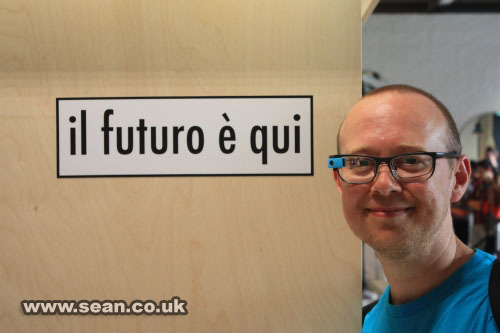 See my blog post with tips on developing Glassware for Google Glass here.